Update, 1/6/2016: With the latest Oculus Rift announcements and public availability coming in March, we've checked prices and updated things accordingly. $600? Ouch. Which means if you're thinking about buying a Rift, you can likely afford a better GPU as well, and you might want to consider checking out Skylake now that it's available. This article was published in the September 2015 issue of Maximum PC. For more trusted reviews and feature stories, subscribe here. Virtual reality is a hot topic for PCs right now, and everyone wants a piece of the action. It’s a Wild West free-for-all as different hardware and platforms are announced, so putting together a gaming rig that can handle the demands of the upcoming VR setups is a real concern. Oculus VR has recently helped clear the air by publishing the recommended specs for its Rift platform. Depending on your current system, the recommended hardware either looks moderately tame or outlandishly extravagant. The core components consist of the CPU, GPU, and RAM: Core i5-4590, GTX 970 or R9 290, and at least 8GB. If you want to minimize on costs, you could easily build a complete Oculus-ready system for around $800, including the OS, but we view these recommendations as more of a minimum rather than a long-term solution. No one likes to be caught unprepared when the inevitable next round of updates shows up, so we set about building a rig that has some room for upgrades down the road. Our baseline rig meets the Oculus recommendations, and when Oculus 2.0 doubles down in a year or two, you’ll be ready. Trusty screwdriver in hand, let’s get busy building. In theory, all you need to get started with building a VR-capable rig is any computer case to house your components, but a poor choice can leave your rig pushing up daisies in short order. If you want to be going strong for several years, you’ll need something more capable. We’ve opted for a larger case that offers plenty of room for expansion; we also chose a slightly faster processor, a motherboard that can support a second GPU, and included an SSD, which ought to be required for any new PC in 2015. The case is Antec’s shiny-new P380, an understated yet attractive design with plenty of room that doesn’t make a lot of noise. Our graphics card is the diminutive Asus GTX 970 DirectCU Mini, packing a lot of power into a small package while using much less power than the AMD R9 290. The CPU is Intel’s i7-4790K, cooled by the Cooler Master Hyper 212 EVO, though the i5-4690K could save you $100 without hurting gaming performance. ASRock’s Z97 Extreme6 mobo is good value, and if you want wireless AC integrated into the board, check out its similarly priced Extreme6/ac. Either one makes adding a second GPU simple. Powering the system is the Corsair CX500, a compact but non-modular PSU. We used some generic DDR3-1600 memory, as RAM typically has little impact on real-world performance. Wrapping things up, we went with a 250GB Samsung 850 EVO SSD and a 2TB Hitachi HDD. As we go to print, Intel has just announced its desktop Broadwell parts, and they should be available by the time you read this. The good news is that the i5-5675C should work fine in the ASRock Z97 Extreme6 mobo we’ve selected; the bad news is that the Iris Pro 6200 graphics and reduced CPU clock speeds aren’t really an upgrade for those using a discrete GPU. Further out is Skylake, with leaks showing a Core i5-6600K for the new LGA 1151 platform. It ought to provide improved performance, but it will also require a new motherboard and memory. Bottom line: We have to build with parts that are currently shipping, so we stuck with Haswell. The past several generations of CPUs from Intel haven’t radically altered CPU performance, and Broadwell doesn’t change that, so the Core i7-4790K should keep you happily gaming for years to come. If you're new to building PCs, it’s often necessary to mount your cooler prior to installing the motherboard into the case. The P380 has a cutout on the back, so you could do it either way, but larger air coolers like the Hyper 212 Evo can be a bit finicky to install, so it’s best taken care of first. We could’ve also skipped the aftermarket cooling altogether, as we’re running stock CPU clocks. There’s nothing wrong with that approach, but the larger fan on the EVO makes less noise and will keep the CPU frosty. It’s also not so large that it will interfere with the DIMMs, but the side-facing fan likewise isn’t going to provide a lot of airflow to the RAM or mobo heatsinks. The P380 comes with three fans—two 140mm at the top and one 120mm at the back—each with a speed selector. All three fans come pre-installed near the top-left of the case, venting hot air. That means Antec is using negative pressure cooling by default, which often has the undesirable side effect of pulling dust in through every crack and seam over time. We didn’t add any intake fans for this build, but there’s room for a couple of 140mm (or three 120mm) fans on the front panel. If you want to use liquid cooling, there’s also room at the top and back for radiators. The P380 has an integrated fan power hub on the back, but it’s there purely for providing power. It would have been nice if Antec had included external fan-speed switches, but cooling worked well enough even with all three fans set to low speed. There are two main philosophies when it comes to wiring your case. Some want a pristine-looking wiring job, and others just tuck everything out of the way and call it good. The drawback of cleaning up the wiring too much is that if you then need to add another component, you’re often stuck undoing your earlier work and then tidying up again. For frequent upgrades, it’s easier to not spend too much effort on the “hidden” wires—it’s not like anyone looks at the back of your motherboard. Also notice that the 8-pin EPS12V cable for the CPU has to reach quite far, and the 26-inch cable on the CX500 makes this easy. A PSU with a 22-inch CPU cable likely wouldn’t be able to route behind the motherboard. Our single GTX 970 is so small in this cavernous case that it looks a bit lonely. Smaller cases might require that you remove one of the hard-drive cages to fit longer GPUs, but not the P380. If you want to add a second GPU, or even go with a couple of significantly larger GPUs, such as AMD’s R9 295X2, there’s room to spare. The case will also support E-ATX mobos, if you’re looking to install something larger. Oculus VR may only recommend a single R9 290 or GTX 970, but the other VR options may end up pushing the envelope further. If you’re looking to add a second GPU in the future, however, we’d recommend stepping up to a 700W–800W modular PSU. Say what you will for other aspects of the case, but the P380 is a real looker. 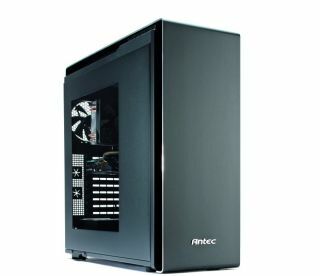 Antec uses 4mm-thick aluminum front and back panels, giving the case a distinctive look, but also jacking up the price. We think the clean front fascia with no external drive bays looks awesome, but what if you still want an optical drive? Antec includes a slim optical drive mount that sits behind the front cover. It’s frankly a bit of a pain to deal with, so if you really want an optical drive you might want to look at a different case. It’s possible to swap around the USB and audio ports on the top, allowing them to face right or left (the default is left). You can also remove all the front drive cages and mount a second 240mm radiator, if you’re so inclined, but that limits storage options. 1. You can fit up to a 360mm radiator, but sometimes a simple air cooler is all you need. 2. The Asus GTX 970 uses a single 8-pin PCIe power cable, helping reduce connectors and clutter. 3. The tiny 500W Corsair PSU has long cables, a must for a case this large. 4. Eight 3.5/2.5-inch trays allow for ample storage, with two 5.25-inch slots up top (but with no external access). For something as demanding as rendering two stereoscopic images for VR, the recommended specs from Oculus aren’t actually that crazy. In fact, our midrange Blueprints going back as far as October 2014 have all been sufficient, and only the shift to Nvidia’s Maxwell 2.0 architecture rules out older builds. That’s simple enough to fix, of course, as swapping graphics cards is one of the easiest upgrades you’re likely to make. From the perspective of many Maximum PC readers, then, Oculus is already within reach. What will be interesting to see is how game developers leverage the available hardware, and that’s always been a sticking point in the console versus PC debate. By defining a relatively high recommended system, Oculus opens the doors for full DX12 support and advanced rendering features. But developers often want to increase the available installation base, so they create lower-quality rendering paths. Considering the Oculus Rift shipping hardware is likely to cost well over $300, however, it’s not too much to expect gamers to have commensurate hardware elsewhere. The final Rift hardware is now shaping up, and it will include an Xbox One controller. Oculus has also revealed an Oculus Touch controller, but that will ship after the initial hardware. We have the Oculus Rift DevKit 2 (DK2), and setting it up can be frustrating—getting the head tracking to work, in particular, was more difficult than it should be. The final hardware now includes a desk-mounted sensor that we’re hoping will be easier, not to mention a single cable to the headset for audio, video, data, and power. The combination should help reduce the space requirements, but for a standing-up experience, you’ll need a decent amount of room. While there’s a lot of potential in VR, it’s a chicken-and-egg dilemma. Developers need hardware in the hands of more consumers to make money creating games. Consumers, however, want compelling software before they buy expensive hardware. And everyone wants the entire experience to be as hasslefree as possible. We’re not there yet, which is why Oculus Rift isn’t expected until Q1 ’16. When we consider the competing hardware and platforms, such as SteamVR, HoloLens, Project Morpheus, OSVR, and Gear VR, it becomes far less clear who’ll win this shootout. Oculus kick started—or Kickstarted—the current VR craze a few years back, but it isn’t the only game in town. It remains to be seen whether we’ll have multiple complementary platforms or a single winner-take-all solution. As exciting as VR is, no one wants to get stuck owning a virtual Betamax setup. Our current zero-point consists of a hexa-core 3.2GHz Core i7-3930K 3.8GHz, 8GB of Corsair DDR3/1600, on an Asus Sabertooth X79 motherboard. We are running a GeForce GTX 690, an OCZ Vertex 3 SSD, and 64-bit Windows 7 Professional.